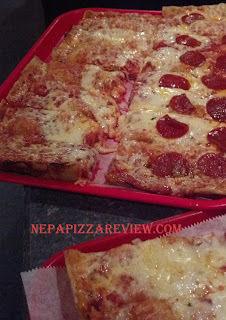 I was looking for something a little different than what I've been reviewing, so based on a recommendation from my most reliable pizza expert, I teamed up with a buddy and headed to Ernie G's in Avoca. The first thing I noticed was the sign with the guy's face on it and wondered what the back story was on that! I never got the answer, but when we entered, it was clear that this was a hometown greasy spoon tavern. It was a lively crowd, and a cool place to relax and catch up with friends. There is a big bar, lots of TV's and plenty of space to hang out. I kind of wished this tavern was in my home town. On to business. I ordered a 7 cut tray of pizza with onion, and my fellow pizza reviewer ordered a 14 cut without. The waittress explained that the onions are optional, but many people order with them so I went for it. I also noted that a 7 cut was quite an interesting number of slices to offer, even more interesting was the steep price tag of $17.48 for a full tray. The 14 cuts does not mean that it's a larger pie than normal, the slices are just thinner. And when the pizza came out, I found out exactly why they cut the slices thinner, because this is one hearty, serious pie! At first glance, we noticed that the crust was very thick, more similar to a sicilian than an old forge, but in the rectangular shape of an old forge. The cheese wasn't spread evenly, with heavy cheesing in some areas, and some areas being quite bare. There appeared to be plenty of sauce, and the onions were applied over the milky white mozzarella cheese. 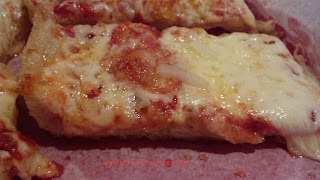 The taste test started with me admiring the thick crunchy crust which was clearly very heavily oiled in the pan. The oil caused the dough to be essentially deep fried in the oven, which was pretty cool I thought. It also made the pizza very heavy, so I was only able to eat 2 of the small slices (in addition to 10 delicious hot wings!). The heavily oiled pan really defined this pizza and made it different than most other pizzas that I've had. The only thing I can relate it to is Pizza L'oven, which I've had once or twice before. 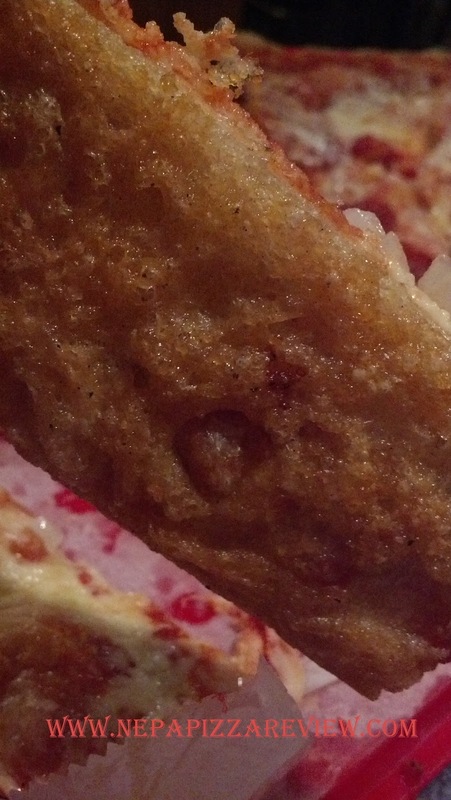 Check out the photo for the deep fried underside of the crust! The sauce was quite sweet, but it was necessary to be sweet to offset the heavy crust, which was ALL BUSINESS! I quite enjoyed it. I probably would have enjoyed it even more if the onions were chopped smaller and sprinkled under the cheese to flavor it more. The nice thing for you non-onion lovers is that you get the option of onion with, or onion without - just like ordering a cheesesteak in philly! Kind of a cool concept, and you don't have to special order the onions to be strained out of the sauce. I did enjoy the onions, but as I said, chopped smaller, and applied directly to the sauce would make this pie realize its full potential. Finally, I thought the cheese was very good. It was of a good quality, and mozzarella is probably the only cheese that would work on this pie. I can't see american or cheddar cheese balancing out this monster. All in all, I think my friend and I were both quite pleased with the pizza, as it was something different. It was very unhealthy because of the deep fried effect, but good nonetheless. My struggle is reconciling nearly $18 for a standard-sized old forge red pizza. Ultimately, the crust is thick, oil is expensive, there was a decent amount of cheese, onions are at no additional charge, but I think this pizza is worth about $12-$13 on the high side. $18 is just too much to ask, but we paid it, and so did the many others that were dining among us, so if your feeling like a "deep-fried" pizza (probably a good hangover cure), head to Ernie G's and you let me know if the pie is worth the money! Comments are encouraged! 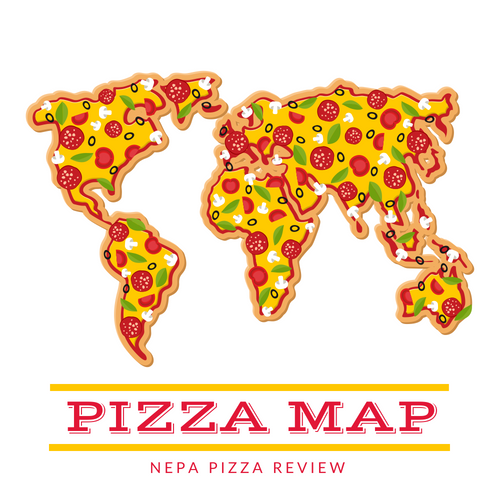 THE BOTTOM LINE: This pizza represents something that's a little bit different. Deep fried goodness served up with your choice of onions with or onions without. It's a very heavy meal at a very hefty price. 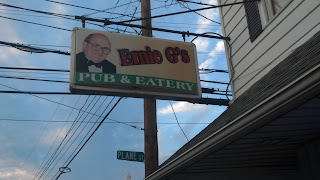 I had Ernie G's pizza for the first time a few weeks ago. I agree it was good and on par with Pizza Perfect, Sizzle Pi and Pizza L'Oven. I felt the sauce was a bit too sweet, but to each is own. Having passed the sign many times, I had to ask about the guy on it. I was told it's the father (deceased) of the owner. I'm glad you had a similar assessment of the pizza. Oh, that's a nice tribute to the father then, the sign really catches your eye. Where is Sizzle Pi at? I've never heard of it. I might want to add it to my list if you recommend it! Sizzle Pi is on Pierce Street in Kingston across from the WVW stadium. I remember when you could get three cuts for a buck. I think it's a little mkre expensive now! They have crazy hours, so call ahead!